Years later, Will finally makes his way home-as an English soldier sent to crush the Irish uprising. When he spies the lovely Eliza, he is captivated by the passionate woman she has become. But Eliza’s passions have led her to join the Irish rebel cause, and Will and Eliza now find themselves on opposite sides of a dangerous conflict. When Ireland explodes in bloody rebellion, Will’s regiment is ordered to the front lines, and he is forced to choose between his duty to the English king and his love for Eliza and their Irish homeland. At the end of the 18th century, the recently widowed Irish countess Eliza is heavily involved in the United Irishmen Rebellion against. She is busy secretly supporting her political stance while maintaining her household and social expectations. Eliza’s fiery passion is caught up in the political unrest until she is faced with the return of Will, her childhood sweetheart. Eliza and Will parted ways when Eliza chose to support Ireland and Will joined the English army. They each much choose between duty and love as their lives once again intertwine. I love stories with strong women, and the Countess of Scandal certainly delivered! The main character Eliza is so admirable in her convictions and spirit. She never falters, even when faced with difficult choices. The author did a fine job of writing a believable romance between two characters with such different life paths, and the love between them feels genuine. 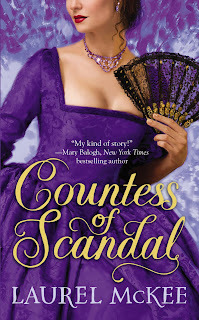 This was a book I found myself reading slowly so as not to have to finish and leave the characters, but luckily, Countess of Scandal is the first of a trilogy. The next two books will tell of Eliza’s sisters, whom readers get to know in this adventure,. I can’t wait! This review is my honest opinion and your opinion may differ from mine. I received a free copy of this book for my review from the Publisher.